Not that they offer so much as a hint of an explanation what black holes have to do with anything. This paper reports the results of an experiment in which the physicists created a condensate that behaves as if it has a negative effective mass. The little word “effective” does not appear in the paper’s title – and not in the screaming headlines – but it is important. Physicists use the preamble “effective” to indicate something that is not fundamental but emergent, and the exact definition of such a term is often a matter of convention. The “effective radius” of a galaxy, for example, is not its radius. The “effective nuclear charge” is not the charge of the nucleus. And the “effective negative mass” – you guessed it – is not a negative mass. The effective mass is merely a handy mathematical quantity to describe the condensate’s behavior. The condensate in question here is a supercooled cloud of about ten thousand Rubidium atoms. To derive its effective mass, you look at the dispersion relation – ie the relation between energy and momentum – of the condensate’s constituents, and take the second derivative of the energy with respect to the momentum. That thing you call the inverse effective mass. And yes, it can take on negative values. If you plot the energy against the momentum, you can read off the regions of negative mass from the curvature of the resulting curve. It’s clear to see in Fig 1 of the paper, see below. I added the red arrow to point to the region where the effective mass is negative. As to why that thing is called effective mass, I had to consult a friend, David Abergel, who works with cold atom gases. His best explanation is that it’s a “historical artefact.” And it’s not deep: It’s called an effective mass because in the usual non-relativistic limit E=p2/m, so if you take two derivatives of E with respect to p, you get the inverse mass. Then, if you do the same for any other relation between E and p you call the result an inverse effective mass. In any case, if you use this definition, you can rewrite the equations of motion of the fluid. They then resemble the usual hydrodynamic equations with a term that contains the inverse effective mass multiplied by a force. What this “negative mass” hence means is that if you release the condensate from a trapping potential that holds it in place, it will first start to run apart. And then no longer run apart. That pretty much sums up the paper. The remaining force which the fluid acts against, it must be emphasized, is then not even an external force. It’s a force that comes from the quantum pressure of the fluid itself. This is by no means to say that the result is uninteresting! Indeed, it’s pretty cool that this fluid self-limits its expansion thanks to long-range correlations which come from quantum effects. I’ll even admit that thinking of the behavior as if the fluid had a negative effective mass may be a useful interpretation. But that still doesn’t mean physicists have actually created negative mass. And it has nothing to do with black holes, dark energy, wormholes, and the like. Trust me, physics is still upside up. Negative effective mass is appealing explanation of behavior as appeared in media. Thanks for detailed explanation as negative mass still illusive in lab. So is the effective mass something like inertia? What i expected from reading all these headlines was that the m in F=ma was negative. After reading this article it is clear that the reality is more complicated than that but would it be correct to sum this up as the discovery of a case where the inertia of the mas is negative? It is important to say that we are talking about quantum mechanics and Newton's laws of motions should not be applied. The bbc article sounds like it should, but laws have limits where it can explain the phenomena. Newton's laws explain motion of big bodies and at low velocities really well, but ten thousand atoms constitutes a very small body and should be used quantum mechanics and not F=ma. That said, I don't think that we should call it a discovery from negative Inertia. Maybe an effective negative inertia, if we push it. The "Effective Mass" phenomenon could be viewed as a quantum simulation of mass, which in this case is negative. By missing out "effective" the Papers are suggesting that it is real mass which has been found which is negative, which is indeed not correct, but there is still a simulation here. Also I believe that the expansion of the BEC was asymmetric confirming this phenomenon only on the right hand side of the expansion - the effective mass to the left was positive. The nomenclature begins with solid state physics with dispersion relation approximation E = E0 + p^2/2m*. In a valence band E0 might be a maximum, more momentum reduces the energy, so m* is negative. Meta-materials offer negative refractive indices. A concave lens will focus light. Special relativity is not threatened. A material with negative (electric) permittivity and (magnetic) permeability is merely following the math. The same stunt obtains by immersing a lens in a medium with higher refractive index. "Scientist creates grant funding out of vacuum!" Sure...but conservation laws demand somebody else got cheated. Thank you for adding clarity to this interesting topic. which includes the nonsense about black holes. PRL seems to have a policy of encouraging press releases of this kind, I really wish they would take action to stop this kind of thing. It doesn't help with the public understanding of science, quite the opposite. The "March For Science" should be followed by the "March For Journalism". 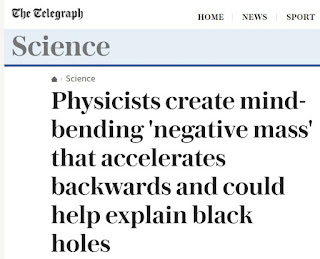 I think you forgot to note that according to the plot, the researchers appear to have created infinitely negative mass, which obviously resulted in the gravitational disruption of the entire Earth. I don't remember that happening, but I was busy that day. Semiconductor scientists & engineers have long been familiar with "effective masses" of charge carriers, although I've never heard of an effective mass being negative. In fact, the _absence_ of an electron can behave as a _presence_ of a positively charged particle -- a "hole" -- with its own effective mass, mobility, etc. Bee, I just discovered your blog, Love it! Thank you. As a physicists I was also bothered by the hypey title and new stories. Reminds me of the stories about faster-than-c light pulses" about 15 years ago. No - they were no faster than c.
@Roy: I was going to ask something along that line. My instinctual assumption was that, rather than some particle having a negative mass, some QUASIparticle had a negative mass. Could you also phrase it in this way (in a non-relativistic field theory), or something similar? If so, is there some sort of relationship between the QFTs that leads to the "black hole nonsense"? Or at least some potential analogy, and that analogy is itself analogous to other analogies between condensed matter and high-energy in terms of QFTs? This makes it more and more difficult to invoke the crackpot epithet. British journalists prove the existence of negative IQ. I'm sure these newspaper articles are mostly nonsense (and I have not bothered to read them). However, I have heard the authors talk about this work, and I would like to emphasize that they do not mischaracterize their results. Maybe they should have used the word "effective" in the title, but to a physicist the word hydrodynamic already makes it clear that this is an effective mass. Most lay people will associate with negative mass an object that falls up. This is exactly what is observed. Negative effective mass means that there is a collective mode (or a quasi-particle) for which momentum and velocity are anti-aligned. This means that an applied force leads to acceleration in the opposite direction. This is pretty cool, and deserves some (accurate) coverage. Now I am sure that there are many caveats. Negative mass can only be achieved in some range of momenta, so quasi-particles don't fall up forever. I also suspect that in this experiment the mass is directional, so things fall up only if the experiment is aligned in a certain way. One final comment: The claim that the definition of effective mass is a "historical accident" is just nonsense. A quasi-particle emerges if the low energy excitations of a many-body system or quantum field theory behave like non-interaction particles. The properties (mass etc) are uniquely determined by matching the free theory to the correlation functions of the full theory. No arbitrariness, no historical accident. When a condensed matter physicist talks about heavy fermion compunds, a nuclear physicist about effective masses of neutrons in neutron stars, or an AMO physicist about the effective mass of polarons in cold gases they all mean exactly the same thing. @APDunbrack: Yes in semiconductor physics it is the quasiparticle "valence hole" which can sometimes be assigned negative mass. Likewise in recent BEC experiments phenomenon were discovered called "dark solitons" which are the (quantum) soliton-like absence of atoms (in a region), whose behaviour is like Brownian motion except with negative mass. I am not sure whether this WSU experiment is being described by such dark solitons though, or another construct. The "Black Hole Nonsense" seems to emerge from the WSU Publicity, and not from the preprint I have seen. It is possible that the WSU research team plan something in the area of merging the two types of simulations - or it might be just confused publicity. The first time I encountered negative mass as a handy mathematical construct was this problem in Halliday and Resnick which asks for the gravitational force on a particle that is a distance away from a solid sphere with a spherical hollow. The problem was solved without calculus by imagining a sphere of negative mass centered on the hollow of the larger sphere. Needless to say, I was impressed by the ease with which the problem was solved! Thanks for the explanation! Negative EFFECTIVE mass is not that much uncommon! In fact in a simple classical situation, a helium-filled balloon goes forward when the car suddenly accelerates.In contrast, other objects such as your head go backward. Using a convention that "holes" have negative mass and negative charge, could lead to more confusing terminology & mental models. For example, the mobility "u" would have to be negative so that the "redefined hole" moves in the correct direction in an electric field. Also the "redefined hole's" diffusion coefficient "D" would have to be assigned a negative value so currents flow in the correct direction when a concentration gradient is present. Having both positive and negative values of "u" and "D" doesn't seem helpful for pedagogical and practical reasons. unfortunately we're stuck with the convention that direction of current flow is defined as opposite of electron flow. This is really disappointing, i already have a PowerPoint slide explaining how negative mass relates to cosmic inflation and my "negative mass weight loss pills". You are confusing inertial with gravitational mass. If you want something to "fall up" you need to change the *ratio* between both, not one of them. Okay this becomes interesting because astronomers (Vera Rubin et al ) have observed galaxies do the same.Does this similarity imply that quantum (gravity ) effects are responsible for flat rotation curves? @Bee "You are confusing inertial with gravitational mass. If you want something to "fall up" you need to change the *ratio* between both, not one of them." Two masses spacetime embedding with different energies pursue non-identical minimum action paths. Baryogenesis’ Sahkarov conditions suggest ~10^(-10) differential chiral bias. Periodic single crystals are self-similar down to unit cells. Crystallography has 11 paired enantiomorphic space groups. The tightest chiral windings are threefold screw axes. alpha-Quartz single crystal solid balls (cm³), chiral emergence volume 0.113 nm³ containing 9 atoms, opposed space groups P3(1)21 9 and P3(2)21, paired shoes on spatial left feet, measurably violate the Equivalence Principle. Look. Well, if I change one but not the other then the ratio does change. In the present case it is not clear to me what would happen. The experiment only created a negative effective mass in the horizontal direction, and studied the effect of the trapping force and of pressure gradients. They did not study what happens if the apparatus is tilted. In the case of electron quasi-particles in a metal I cannot observe an individual electron falling inside the metal because the gravitational force is always balanced by Coulomb effects, and the metal as a whole must respect the equivalence principle (so the force is proportional to N_e m_e, not N_e m_e^*). In the present case the effective mass arises not from coupling between the atoms, but from coupling to a laser field. I think it is plausible that if the apparatus were tilted without the negative mass region the cloud accelerates due to gravity, but if the negative mass regime is present then the cloud decelerates. This is not shocking -- we already know that neutral atoms can be levitated by laser fields. But it still interesting that the effect is described by F=ma with a positive gravitational mass and a negative, momentum dependent, inertial mass. @Thomas Schaefer " I cannot observe an individual electron falling inside the metal because the gravitational force is always balanced by Coulomb effects"
Drop it down a vertical single wall metallic carbon nanotube. They can have large diameters. 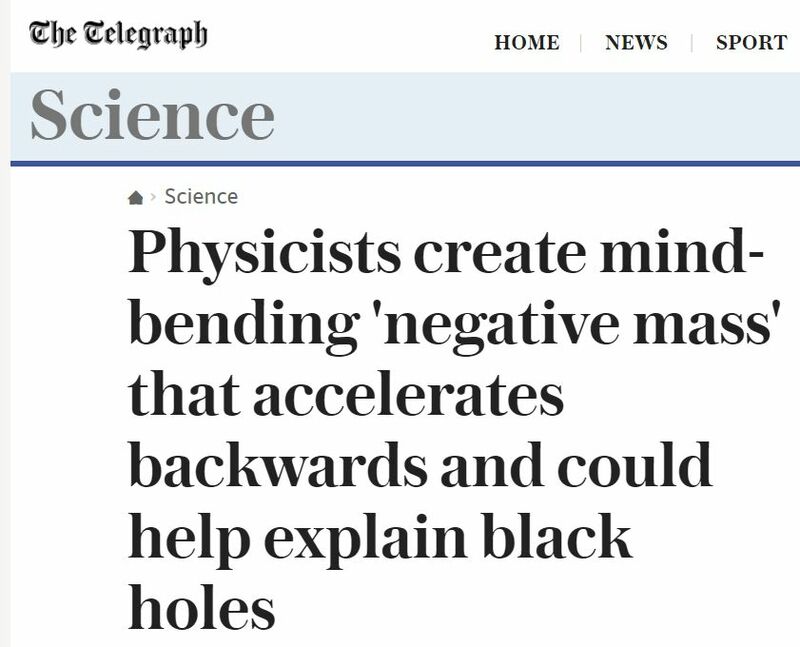 The minute I saw the posting on the internet I thought that they were seeing some sort of effect related to the Higgs field - assuming their apparatus had cancelled any gravity or bias effects. Catching Light – New Video!